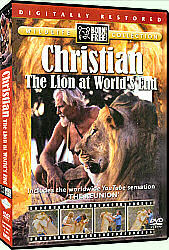 For those who wish to contribute to Christian's legacy, John Rendall recommends WildlifeNOW.com (or The George Adamson Wildlife Preservation Trust for those outside the US). John Rendall is one of the two men who raised Christian in England, and he is currently a trustee of The George Adamson Wildlife Preservation Trust. The charity is hoping to raise funds to restore the Kora preserve where Christian was rehabilitated. The filmed-as-it-happened story of Christian the Lion is available on DVD! The true story of a lion cub taken from his zoo-caged parents and sold in a London department store, and bought by two of the most understanding men a lion could hope to meet. Named "Christian", this remarkably gentle and intelligent lion became a British celebrity and professional model. As he reached maturity, his owners decided to give him something he was never destined for: freedom to live as a wild lion in Africa. A chance meeting with "Born Free" stars Bill Travers and Virginia McKenna led to an appeal to George Adamson to take Christian and teach him how to be a wild lion. "Christian the Lion" is a most extraordinary film. It was made to finance the long effort to bring Christian to Africa and establish him with a pride of lions. You will see Christian in London and in Africa, George Adamson and his brother Terrence, many lions the Adamsons worked with closely, including the huge Boy from the movie Born Free, and the ENTIRE heartwarming reunion scene you've seen on YouTube. This is the genuine, full-length, original documentary. Now digitally restored with 7 more minutes of original footage that was not included in previous editions. These DVDs are factory made, factory sealed, brand new, and guaranteed to play on US DVD players. They ship from the US for fastest service to US addresses. 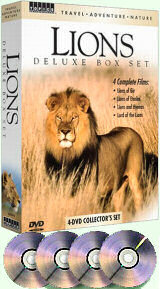 These DVDs represent the best version of the film of Christian the Lion you will find anywhere. Please note that this documentary about Christian was made as it happened, and was completed in 1971. Therefore, it does not include footage from Ace and John's last visit to Africa in 1972. It also does not include the Whitney Houston song that was heard on YouTube. This DVD will play on US DVD players. 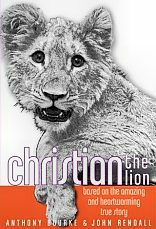 The phenomenal true story of A Lion Called Christian has been republished in an expanded (224 pages) book with more text and more pictures! 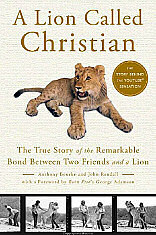 Anthony Bourke and John Rendall have updated the book about Christian the lion, and the new edition was published on March 10, 2009. Click one of the links at the right to order your book from Amazon.com. Buy the newly revised hardcover book here! Buy the newly revised paperback book here! Audiobook: The complete, unabridged book A Lion Called Christian on CD! The complete text of the new book (above), read by John Lee. 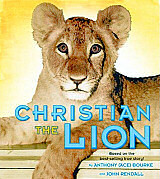 A Lion Called Christian AudioBook. For young readers, the true story of A Lion Called Christian is now in a new book designed for Ages 9 - 12! The true story of a lion cub taken from his zoo-caged parents and sold in a London department store, and bought by two of the most understanding men a lion could hope to meet. A year of fun and mischief later, Christian has grown up, and Ace and John realize that their pet needs to be among other lions and deserves to live free, in his natural environment. Luckily, the friends meet a couple who offers to help them introduce Christian to the African wild. 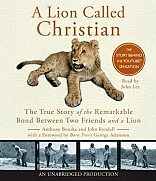 Christian the Lion not only tells the riveting true story of one animal’s ability to adapt to life in the wild, but also lifts readers’ spirits by capturing the unexpectedly enduring connection between man and beast. Includes a 16-page color and black & white photo insert and a 16-page insert with Fun Facts About Christian and more! Click the link at the right to order your copy from Amazon.com. Buy the young readers' hardcover book here! Imported Paperback version of the young readers' book. A paperback edition of the book described above. The link at the right will allow you to buy this imported book from US sellers. Buy the young readers paperback book here! 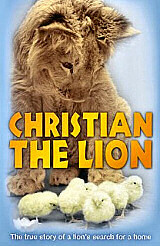 Christian the Lion - Imported Young Readers' Version. A hardcover picture book with many previously unseen photographs. This book follows Christian as he grew from a tiny ball of fur into a majestic lion. Here is the incredible story of the remarkable journey to take Christian back to the wild. 32 pages. Click the link at the right to order your book from Amazon.com. Buy the picture book here! Christian the Lion Picture Book. "...and I Will Always Love You!" Shirts (printed front and back! ), mousepads, and more at Printfection.com. Mugs, clocks, and many more items at CafePress.com. Same items, different picture at CafePress.com. A portion of the proceeds from the sale of the above items have been donated to The Tony Fitzjohn/George Adamson Wildlife Preservation Trust. The Lions Deluxe Box Set includes four of the best wildlife films ever shot on the subject of the king of beasts. Click the link at the right to order your copy. Buy the DVD set here!